When to plant: Best seeded under cool and moist conditions in the spring. Harvest when good sized but still tender. 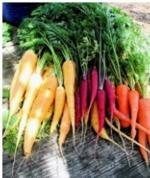 Can be stored in the ground during the cool season for harvesting as needed. If left in the ground too long, they may get woody or bolt (send up a flower stalk). Prepare soil so it is fine and lump-free to prevent misshapen roots. Seeding directly in the ground is best because transplanting also tends to produce misshapen roots. Cover seeds lightly and keep moist. Thin to 1-2 inches apart. For our typical heavy clay soils, short or round varieties such as those listed below are best. Nantes Blunt, cylindrical, 6–7" long. There are multiple Nantes-type carrots.